Whoever came up with these little milk soaked sweet melt-in-the-mouth treats was a genius. 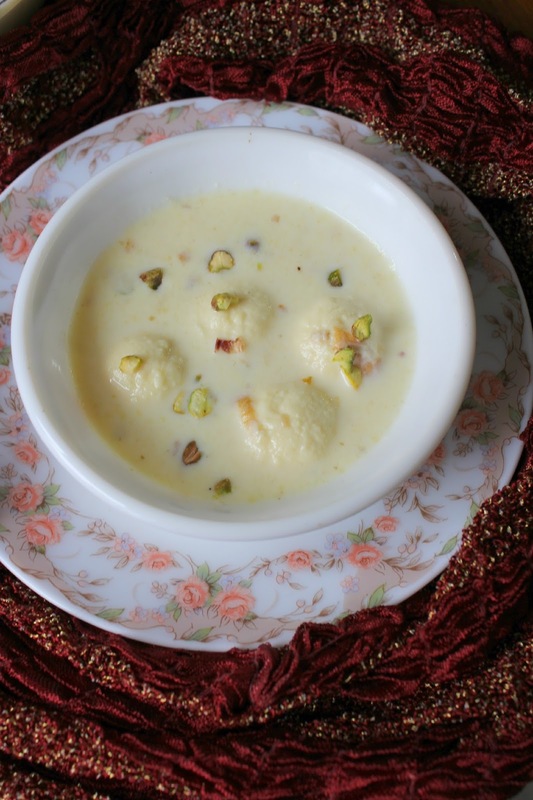 Rasmalai is one thing the entire family agrees upon – everybody even both mother-in-laws, the two ends of a spectrum do. This was the first time I tried Rasmalai at home. I’ve come halfway before – I’ve made Rasgullas before but not Rasmalai. If you can make Rasgullas then you’re pretty much there. You just need to slightly flatten the rasgullas, squeeze out the sugar syrup and then dunk in the reduced sweetened milk. I made these Rasmalai for a pot luck and they were a hit. They’re a crowd pleaser and they really aren’t too difficult at all. Rasmalai is from the state of West Bengal which lies in eastern India. West Bengal has a rich tradition in literature and arts and most definitely food. Fish and rice are important Bengali staples but so are sweets. Bengali sweets are distinctive – they’re light, spongy and not overly sweet. I am really looking forward to trying more Bengali sweets in future now that the Rasmalai turned out well. Freshwater fish are abundantly cooked in Bengal. The panch phoran whole spice mix and mustard paste are characteristically Bengali and are used in a variety of dishes. I can vouch for the panch phoran being a magical combination. I don’t know about mustard paste though. I think you’ve got to “get it” to like it. I am always impressed by the pride and passion with which Bengalis talk about their food. Bengali food is something that’s always been on my to-try list. With this state-wise marathon my interest has been piqued even further. This state-wise blogging Marathon has opened up a world of dishes made right here in India. I am rediscovering the food of my own land (TamilNadu) and it was fascinating learning about it. Put together, India’s cuisine is as fine, rich and intricate as any other world cuisine. I am no expert but I don’t know if any other country would have such a massive, ingenious variety of foods. The curries, kebabs, biryanis and dosas are just the popular few that restaurants chose to sell. The wealth of Indian food is made every day in homes, roadside stalls and villages. I need look no further for inspiration. 1. Heat one litre of milk in a pot for the rasgullas. Simultaneously you can heat the other litre of milk in a wide pan for the sweetened milk. Add cardamom pods to the pan. Make sure not to use the same spoon or ladle for the two of them. You’re going to curdle the one to make rasgullas and reduce the other for the sweetened milk. 2. When the milk is about to boil, squeeze in lemon juice (substitute vinegar) and wait till the whey separates. You’ll see the paneer that separates from the now greenish looking liquid. Switch off. Strain the liquid through a muslin cloth, twist tight and hold under running cold water to cool and remove the lemony acidity if any. Squeeze out all the water and turn out the paneer into a bowl. Knead the paneer till it is smooth and makes a nice smooth dough. 3. Meanwhile keep stirring the milk in the pan so that it doesn’t burn. Use a thick bottomed iron pan. It works best for me. Keep heat low and wait till it reduces to about 2/3rd its original volume. It need not be as thick as basundhi. It has to be slightly thicker than whole milk. When it has reduced, add in the milk powder which should thicken it further. Also add sugar and mix. Taste and adjust sugar if necessary. Switch off, add saffron strands and cool. 4. Pinch small marble sized balls from the paneer dough and roll into balls. Keep covered. 5. To a pressure cooker, add the ½ cup sugar and sufficient water to immerse the sugar. When sugar has dissolved, gently transfer the paneer balls into the pressure cooker. Make sure there is enough sugar syrup to cover them all. Cover with the pressure cooker lid and turn heat to high. Pressure cook for about 10-15 minutes. Set aside to cool. Open the pressure cooker and eat rasgullas as is. Or if you’re restrained enough, continue to make rasmalais. 6. Remove each rasgulla using a spoon. Press the rasgulla with the back of another spoon to squeeze out the sugar syrup and then dunk in the cooled sweetened milk. Repeat with the rest of the rasgullas. Garnish with chopped pistachios. Refrigerate the sugar syrup and use for other sweets. 7. Refrigerate the rasmalai. Serve chilled. This entry was posted in Desserts, Party Food and tagged bengali sweet, Blogging Marathon, dessert, desserts, indian mithai, indian sweets, rasgulla, rasmalai, recipe, sweets, west bengal cuisine. Rasmalai is one of my favorites. Nice pick for a sweet ending to this month long journey. Irresistible rasmalai, fantastic choice to finish this long marathon, wish i get some rite now, they are just awesome. Ras malai is always the go-to dessert in any Indian restaurant for us. beautiful way to end the marathon, with these super delicious rasmalais..wow I am loving them. Very sweet way to end the series Jayanthi. Love rasmalai and yours look perfect. You have got the best for the last looks like..:)..when I had done this for ICC, I made it about 4 -5 times becos we loved it..your pictures are so sinful! Nice way to end the series with a sweet dish,Rasmalai is one of our family's favorite,looks irresistible.. Growing up, this was one of the few Indian sweets I liked. Now it is a totally different story. I eat anything sweet, irrespective of what it is. I made this sometime ago for ICC. Your ras mali looks very good. My all time fav bengali sweet and my friends love it a so make them often for them 🙂 such an rich and decadent dessert to end up the marathon 🙂 fabulous job !! This is my favorite dessert.Okay one of my favourite desserts. Ras malai looks amazing ! clicks are very beautiful….